From a master of contemporary fantasy comes the first novel of a landmark series unlike any you’ve ever read before. 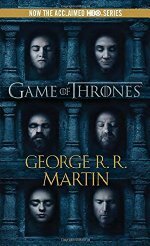 Part II of our read of the first novel of A Song of Ice and Fire. This read-through is Spoilers All; material from all books and the show are fair game in the discussion. First-time readers who have seen the show will likely not be spoiled, except on events that have not happened (yet) or may not happen on the show. Discussion should primarily focus on the chapters and events that occurred in this section of the read-through, but information/clues/foreshadowing of future events that are found in this section may (and likely will) be highlighted for their importance. Jon III: Jon gets his privilege checked. Eddard IV: Ned makes a new friend. Or not. Tyrion III: A giant at the end of the world. Arya II: Some lies are not without honor. Daenerys III: A dragon stirs. Bran IV: Old Nan dishes some dirt. Eddard V: Webs and intrigues and lies. Jon IV: Sam the Slayer arrives. Eddard VI: Gendry before the boat. Catelyn V: An unexpected pleasure. Sansa II: A night with the not-knight. Eddard VII: No songs for spiders. Tyrion IV: The road to the Vale. Arya III: Whispers in the dark. Eddard VIII: Quarrels with the King. Catelyn VI: Problems at the Eyrie. Eddard IX: The Wolf and the Lion. All I've done so far is skim through, but I noticed something interesting. One of the things I note at times is that Martin uses the same phrases and same images between different points of view (so I'm not thinking of the phrases that characters repeat to themselves, here, but rather pieces in the text that carry over) and usually this is done to underline a point or some piece of information. All day, Will had felt as though something were watching him, something cold and implacable that loved him not. She could feel its empty eyes watching her through the gloom, and there was something in that dim, cavernous room that did not love her. Somewhere between the first few chapters and where I am now (Dany III) the language stopped reading as shapeless, and I started noticing some of the ways the writing changes depending on who is at center stage. It's most notable in the Sansa or Arya sections - the authorial voice reflects the character's internal state. Yeah, the writing smooths out here and you start to feel like the characters actually are characters, not just vehicles for the plot and exposition. -Bran IV raises all kinds of interesting things in a re-read. Old Nan - who is she? Where did she come from? Just how long has Old Nan been there anyways? And Nan gives us some insight into the tricksey nature of history in Westeros. Lots of different Brandons in the family line, and Nan gets them confused, along with the legends of Bran the Builder and if the same one raised the Wall and Winterfell. So what is fact and what is fiction about the history of Westeros and the Great Houses? Difficult to tell here. Plus, she tells of the Others, and is really one of the only information sources in the entire series about them. Some bits from that I found interesting - "the last hero" goes out to find the children of the forest in the hopes that they can "win back what the armies of men had lost." That's an interesting way to phrase it; not that the Others had won the battles and were conquering the First Men, but that the armies of men had lost the land...which is maybe a very veiled statement about the First Men driving away the Children and perhaps some things getting lost/forgotten along the way. Or maybe I need more tinfoil. He also travels with a sword, a horse, a dog, and a dozen companions, all of which die and his sword breaks. I'm trying to match some similar symbolism from elsewhere in the series, but I'm blank. And hey there - "pale white spiders big as hounds" - that sounds cool. Hoping we see these on page and screen sometime. Also, it was very neat in this chapter to see Robb so uncertain and so young; I remember him most from the later books, where he is very much acting the man and we so rarely see the scared boy inside. -I also think Arya III is fascinating now, given the plotlines that unfold in ADWD. The conversation between Varys (in disguise) and Illyrio takes on some new shapes. "This is no longer a game for two players, if it ever was". I'm still assuming Varys is refering to himself and Illyrio, but it feels like it could mean more. Also, I really enjoyed the juxtaposition of the ending of Eddard V - "Distrusting me was the wisest thing you've done" and Jon IV, which follows with "What sort of man would proclaim himself a coward?". Littlefinger is not trustworthy, and makes himself seem trustworthy by constantly proclaiming what a snake he is. And Sam has the bravery to admit a hard truth about being a coward, which makes him what? Oh, and - the conversation between Sansa and the Hound. Really great moment as Sansa gets brought into the real world, and a monster of a man reveals something personal. I never liked the show decision to give that moment to Littlefinger. Not sure where I am now in relation to these posts - my edition does not number the chapters in the manner you have adopted. Just started the Vale-set Catelyn which opens on the morning of the trial by combat, and it struck me that the trial is intended and depicted as counterpoint to the tournament, something largely lost in the screen adaptation. I think you're a little beyond where this section is at; this one ended with Dany entering Vaes Dothraki, and I think the trial is in Cat VII, which is a few beyond. I don't think any of the editions number the chapters. It is an convention that readers have adopted, in an attempt to be able to explain where in a book certain events occur, but even then it doesn't work great, because without a description of the events of the chapter, I find the number meaningless. Hence my attempt to provide pithy one sentence summaries with them, but I might be better off just linking to the chapter summaries instead. Or something. I feel like trying to swallow a whole book in one go is too much, but maybe breaking it up like this is too confusing. I'd make the chapter spans even sorter, ~5 per post. 20ish chapters seems a lot for a discussion. Maybe it'd help to add a "this post covers events from to " to make the boundaries between posts clearer? Eh, the last chapter summary effectively does that. enh, I dunno about reducing post count. We just finished s01 rewatch and while my first read lags a bit, it's at most a two-day march. I don't think we'll get to s05 before April 24, nor will I finish the books in 30 days. Reducing post span here would likely reduce my post participation. I think these posts are roughly quartering the books? Seems about right to me. Caught Kira Roessler's "Dialogue and ADR Supervisor" credit on S02e02 just now. Which seems perfect, really. I'll keep dropping stuff in here until the next top-level post shows up. In the throne room scene following Robert's death, much is made of Ned's bum leg - Littlefinger helps him down steps; he hops and hobbles the length of the throne room. Whereupon Cersei explicitly instructs him to "bend the knee". Lots of different Brandons in the family line, and Nan gets them confused, along with the legends of Bran the Builder and if the same one raised the Wall and Winterfell. SO MANY BRANDONS; "she had lived so long that all the Brandon Starks had become one person in her head." And it drives home a point that Bran was given an important Stark name, one that sets a certain expectation of living up to. Nan's story is interrupted, right at "pale white spiders big as hounds", and we don't get to hear the rest of it; GRRM still teasing out fragments of winter lore. SO GOOD; and yes, it plays so much better in the book. The show combines Littlefinger's "you have the Tully look" with the telling of the Hound's story, and it diminishes it. A nice contrast here:Joffrey rejects Sansa's pity, the Hound accepts it: "No, no, little bird, he was no true knight." I liked also the gradual unfolding of the possible conspiracy around Ser Hugh's death on the field. Sansa saw him only as "some stranger from the Vale of Arryn whose name she had forgotten as soon as she had heard it" that met with an accident in the joust. The Hound knows better: "Gregor's lance goes where Gregor wants it to go." Ned in the following chapter suspects: "slain by a Lannister bannerman before Ned could speak to him; could that be mere happenstance?" Sansa again is the naive one, who knows the courtly words but isn't aware of courtly intrigue. "Some septa trained you well. [...] A pretty little taking bird, repeating all the pretty little words they taught you to recite." I'm only up to Bran IV. But yes, I remembered that we don't really hear much about Old Nan after AGOT. I assume she doesn't survive Ramsay's sack of Winterfell? It's unclear what became of her. The actress from the show died, so GRRM may just leave it unanswered. Yeah, I made a mental note to try to pay attention to Old Nan during the events of ACOK to see if I can figure out what happens to her. I don't recall any specific mention in the book, and in the case of the show, the role just got dropped with the death of the actress. Well, I can never remember what colour Old Nan's beard was anyways. I'm at Catelyn VI. I totally forgot the names of the people in her little merry citizens-arrest band that abducted Tyrion, saved for Bronn, Marillion, and Rodrik, and then I was quickly reminded of why. Arya's eavesdrop on Varys and Illyrio, on reread, seems soooo much more prophetic. And I remember not recognizing it's Varys my first time through. But the little hints are very telling, like the mention that he seems to glide across the floor when walking.